It is incredibly important that you take precautions when cycling at night. One of the easiest and most popular ways to keep yourself safe on the roadside is through installing quality bike lights to your bike. It is actually a legal requirement for cyclists to have a white light on the front of their bike, for visibility, and a red light on the rear. During the autumn and winter months it is difficult to avoid the dark, so having good quality bike lights that are bright, long-lasting and durable is essential. Many cyclists will also use bike lights during the day when riding in certain locations to increase their visibility and keep our roads safe for everyone. This bike light is incredibly bright and has a great battery life, which is easily recharged through the USB port. The bike light has three light modes to keep you safe in every situation; Run Time Steady, Half Steady, and Flash. The compact taillight also has three modes to keep you visible at all times. These bike lights are easy to install with their rubber straps and quick release mount. They can be fitted to most bike models as well as being easily removed to be used as a flashlight in emergencies. 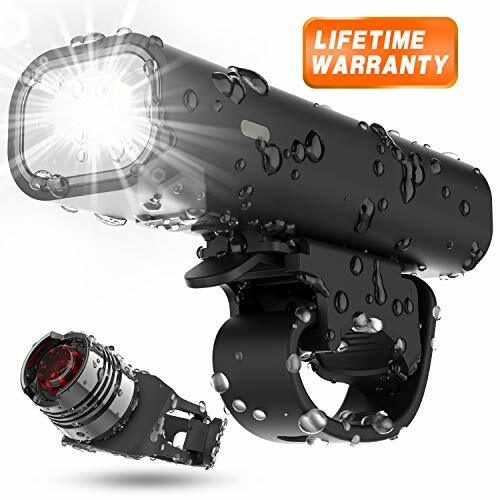 The lights have solid construction and are waterproof, making them suitable for all seasons. 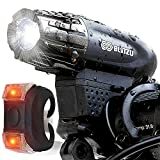 Why We Liked It – This bike lights set is a great value product, durable and can be used as flashlights during an emergency. This bike light is a convenient model due to the fact it is rechargeable, which saves you from having to spend money on batteries ever again. It takes two hours to be fully charged and can be plugged into any UBS port for effortless power. 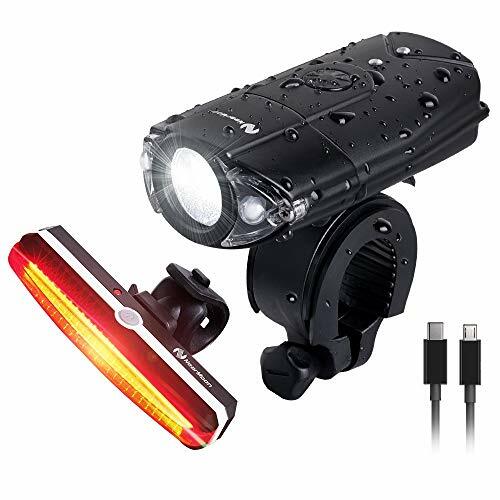 This bike light set is great value as it comes with a front headlight and a tail light for 360-degree visibility on the road. This bike light is versatile, durable and waterproof making it suitable for all cyclists and seasons. The headlight can also be used as an emergency flashlight when on the road or at home. It is incredibly easy to install and has a tool-free operation. These bike lights are brilliant for those on a budget and are incredibly easy to install. They can be installed onto your bike, backpack or other equipment within seconds as they do not require any tools. 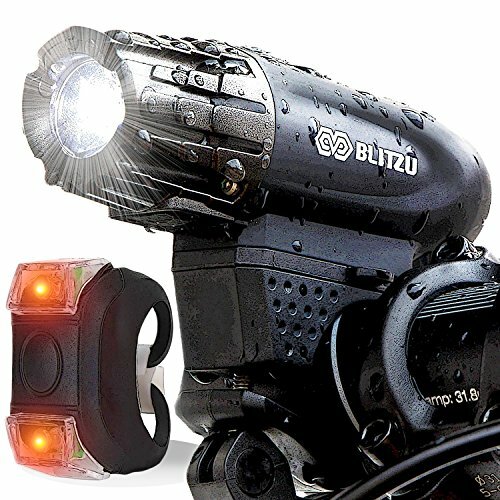 This makes these bike lights incredibly versatile. The body is made from durable silicone that is waterproof and can withstand any kind of weather. The lights have three specific modes of high, low and strobe to keep you safe in all situations. They offer visibility for up to half a mile and have a 30-day guarantee making them good value. This set includes four bike lights. Why We Liked It – Staying safe on the road doesn’t have to cost a lot, and this multi-pack is a great way to stay safe. 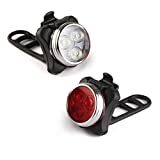 These bike lights are made for outdoor activity and can be used as an emergency light source when hiking or camping as they are durable and waterproof. They have a great range of 30-40 feet in the dark. Both the headlight and the taillight have three lighting modes to keep you illuminated in all situations. These bike lights are easy to install and should fit most bike models. They have a quick-release design that can be attached or removed within seconds. The headlight has a compact design, and the taillight has a range of versatile uses. Why We Liked It – These bike lights are convenient, compact and versatile with their great range and three lighting modes. 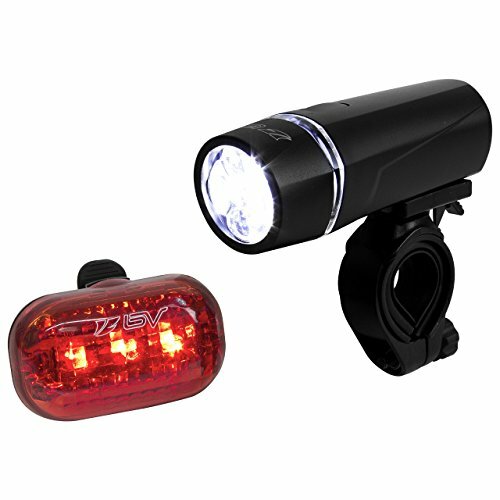 The Te-Rich Rechargeable Bike Lights Front and Back are high-quality and versatile bike lights. They have an incredibly bright light that can keep you visible for miles down the road. The lights are waterproof and durable, making them suitable for all occasions and seasons. They have four working modes and a long run-time which is ideal when on the road. The battery is rechargeable which helps save you money over time and works to keep the lights running for longer. The redesigned mount is suitable for most bike models and is super easy to install. This bike light has a rechargeable battery which makes them ideal for long-term use and works to keep you safe for longer. This is a super bright light that can keep you visible for longer when on the road. It has an incredibly fast charging time of two hours and is waterproof. 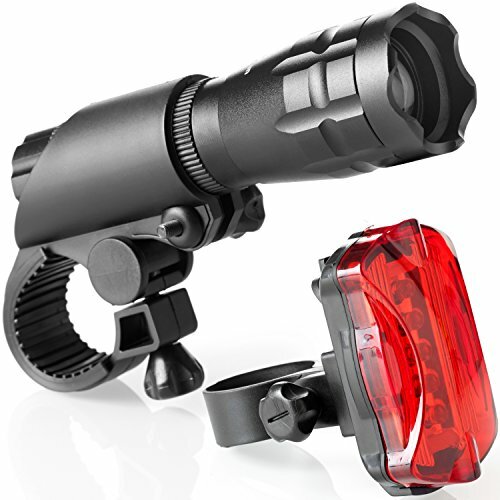 The light is easily operated with a button on the top of the pack and can be easily installed onto most bikes. The lights have four lighting modes; low, mid, high and flashing to keep you safe on all roads and in all seasons. Why We Liked It – This bike light is incredibly bright, durable and has an easy operation. 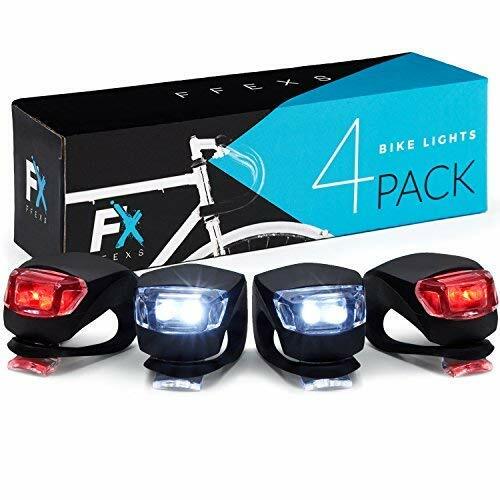 The FFEX Bike Lights Front and Back is a great value set that has four bike lights, two for the front and two taillights. They are certain to last a long time and should any light go out, there is a spare set included. These lights are incredibly bright and can be easily attached to any model of bike. They have a simple but efficient design that is waterproof. 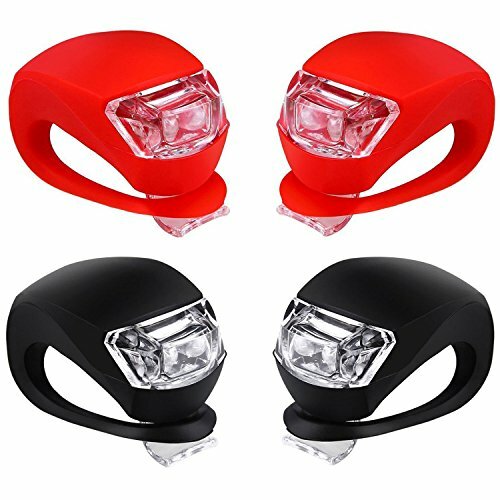 The body of these bike lights is made from silicone which is a flexible, waterproof and durable material. This means these bike lights can be used in all weather and are certain to last a long time. Why We Liked It – These bike lights are durable, flexible and affordable making them ideal for all cyclists. 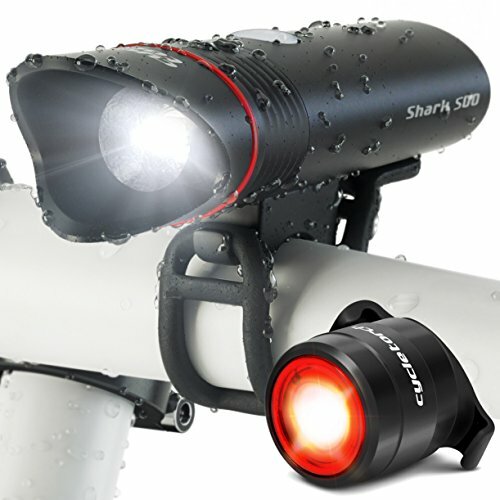 The Cycle Torch – Shark 500 is a rechargeable bike light that can provide hours of illumination with only two hours of charge. It has an incredibly bright light that can help you stay visible all night long. There are various light settings that can provide different levels of illumination for different occasions. These lights can be used during the day or night and are incredibly easy to use. The installation does not require any tools and can be used on any kind of bike. They are water resistant and have a flat beam that has been specially designed for cyclists in urban areas. Why We Liked It – These bike lights are incredibly bright and can be fully charged within two hours. This is a reliable bike light that makes it easy for you to be seen by motorists at night. They are high-quality and are made from solid aluminum that is reinforced by ABS plastic. This means that the material will not rust and can withstand all weather. The bulbs are incredibly bright and have long battery life. The set includes a headlight and red taillight both of which are easy to install and have a firm body. They can be screwed onto the bike without tools. This is incredibly convenient and ideal for people on the go. Why We Liked It – These bike lights are bright, durable and easy to install on most bike models. 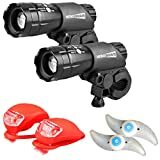 This is a great value set of bike lights that have a super bright front light and convenient taillight to keep you safe on the road. Both of these lights are powered by rechargeable batteries that can run for hours. They are incredibly easy to operate, even when wearing cycling gloves and on the go, as the rubber button is easily located. There are three brightness modes that meet the different requirements of the weather or the environment. The lights are made from airplane-grade aluminum and ABS which makes them incredibly durable and long lasting. Why We Liked It – These bike lights are incredibly durable, tough and long-lasting to keep you safe for longer. Bike lights are a legal requirement, and it is so important for you to get it right. You are required by law to have a headlight and a red taillight on your bike to ensure that you are visible at night. Having lights on your bike is a great way to keep you safe and, as you are preventing accidents from occurring, you are actively making the roads a safer place to be too. Perhaps the most important thing when looking into bike lights is how bright they are. The brighter the light, the more visible you will be on the road. In most cases, the brightness of a light is measured in lumens, although this may not apply to some LED models. The highest lumens throughout this review is 1200 lumens in the Te-Rich Rechargeable Bike Lights Front and Back. Most bike lights throughout this review are LED. LED lights are the most popular kind of bike light as they are compact, relatively affordable and durable. This kind of light source, which is used in the BV Bicycle Light Set Super Bright 5 LED Headlight, is long lasting and cheap to run. If you are looking for a bike light to be used on the road, then a beam light is most appropriate. Luckily, a lot of bike lights are designed to be used on the road so they have a controlled beam that will not distract motorists while still keeping you illuminated. Lights such as the Cycle Torch – Shark 500 USB Rechargeable Bike have a flat beam that has been specially manufactured to be used on the road. Many other models throughout this review have multiple light settings that can be used in different locations. 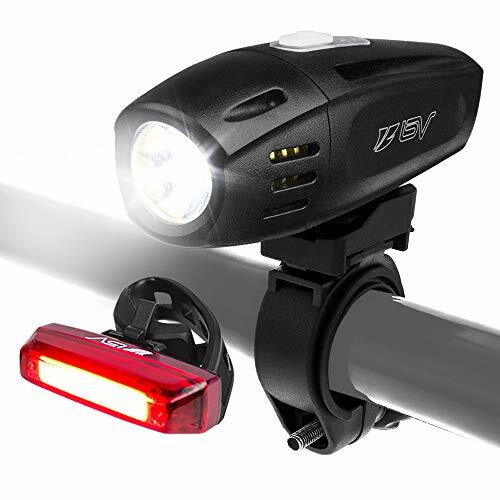 The BV Super Bright (300 Lumens) Rechargeable Bike Light Set has three light settings which can be used to brighten or dim the bulb depending on where you are riding or what the weather is like. In order to find the best bike light for riding on the road look for narrow or flat beams. Alternatively, you can find bike lights that have multiple light modes to adjust when appropriate. Bike lights should be used in every season, but it is likely that you will use them more often in the fall and winter. This means that it is important for your bike lights to be waterproof and weather resistant in order to be suitable for the harsh weather of these seasons. Most lights throughout this review are made to be waterproof, although some materials are better than others. Silicone is a popular material used for bike lights, as seen on the Malker Bicycle Light Front and Rear Silicone LED Bike Light Set, due to the fact it is durable, flexible and waterproof. ABS plastic is also a popular material used in bike lights. 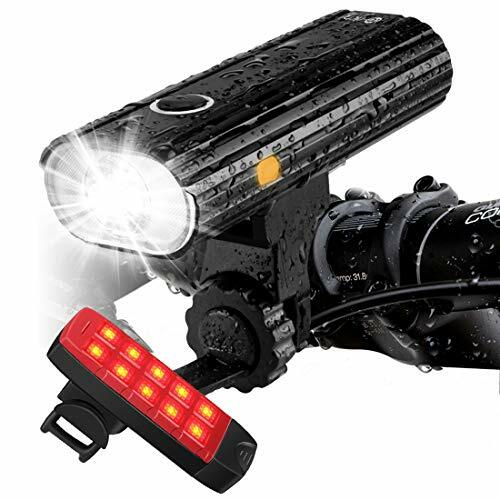 The TeamObsidian Bike Light Set – Super Bright LED Lights have a metallic base and are reinforced with ABS to make them weather resistant and suitable for wet conditions. – Is it illegal to ride a bike without lights? It is illegal to ride a bike on a public road in the dark without a headlight, taillight, and reflectors. It is important that you stay safe and keep yourself visible when cycling at night to prevent accidents on the road. There are specific regulations about what kind of lights you need and where they need to be placed depending on your location. Before riding your bike at night, you should check these regulations and purchase bike lights.